Product prices and availability are accurate as of 2019-04-19 18:26:56 UTC and are subject to change. Any price and availability information displayed on http://www.amazon.com/ at the time of purchase will apply to the purchase of this product. There's not a more comfortable naptime or poolside experience that lounging on an outdoor daybed with shade-blocking, retractable canopy. 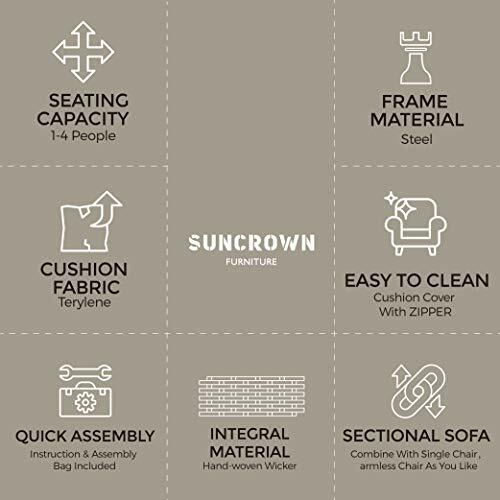 When it comes to backyard comfort, we've all enjoyed some great sofas, chairs, hammocks, and rocking chairs; but nothing is quite as amazing as the fun, innovative and luxurious Suncrown Daybed with Retractable Canopy. 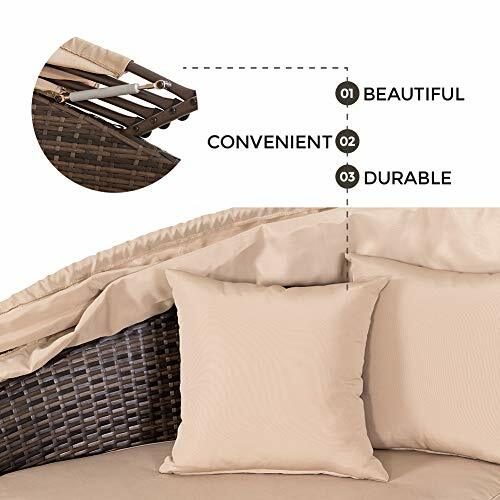 Offering truly sprawling, relaxing comfort, you can stretch out, snuggle a loved one, or fall asleep reading your favorite novel-and all without wilting under the sun. 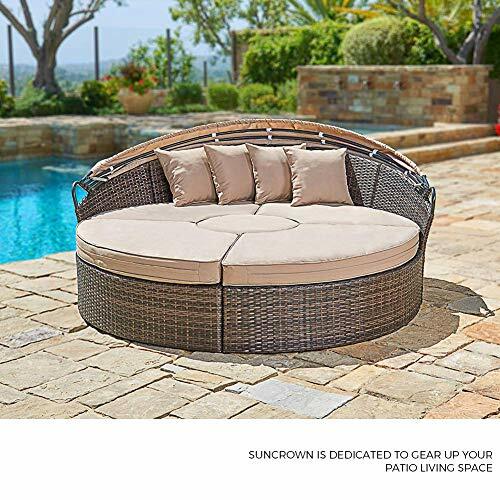 Suncrown wicker furniture is not only crafted with rain, and wind-resistant resin, this unique daybed piece features an adjustable canopy to block out the sun. Even better, it can be broken down into four individual chairs with a matching table centerpiece so you can entertain guests during parties, barbecues or gettogethers. Ready for truly relaxing outdoor comfort? 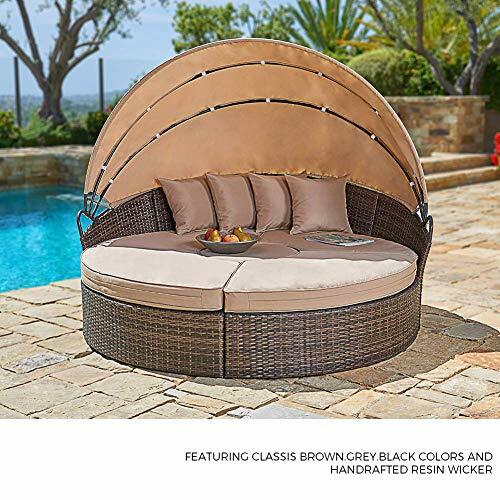 Click 'Add to Cart' above and get a round wicker daybed and find soothing shade under the retractable canopy! INNOVATIVE COMFORT & STYLE - A luxury feel you'd find at a resort or day spa, our outdoor wicker sofa daybed with retractable canopy offers premium relaxation. 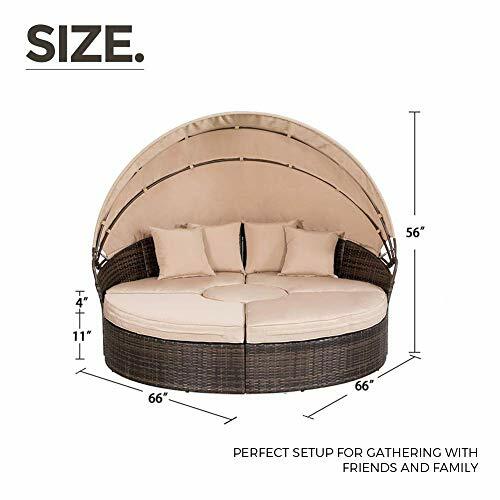 MULTIPLE STAGING OPTIONS - This outdoor patio furniture set can be used in the standard clam-shell design or separated into four chairs and a table for guests. RETRACTABLE CANOPY - Each outdoor daybed comes with thick cushions with removable covers and a canopy that provides adjustable light-blocking comfort. ALL-WEATHER WICKER - Designed for outdoor use, our wicker patio set is durable enough to withstand rain and wind for year-round use. Crafted with aging-treated wicker material to mimic the natural wicker material, just like the light wash jeans. This manually treated wicker is actually more expensive than the bright and smooth one. TEAM ASSEMBLY REQUIRED - Every daybed comes with all required hardware and it's recommend that 2 people it assemble together. 60-90 minutes estimated assembly time. If you find any damage caused in transit, please contact us to help you immediately!